Start planning the perfect Orlando wedding with these stunning outdoor wedding venues in Orlando. 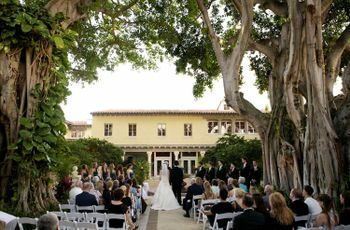 Whether you’re traveling to Central Florida for a tropical destination wedding or staying in-town for a warm hometown affair, these outdoor wedding venues in Orlando offer a bit of everything to suit many different aesthetics. Thanks to near year-round sunshine and favorable temps, outdoor wedding venues in Orlando and surrounding towns are almost always in high-demand. 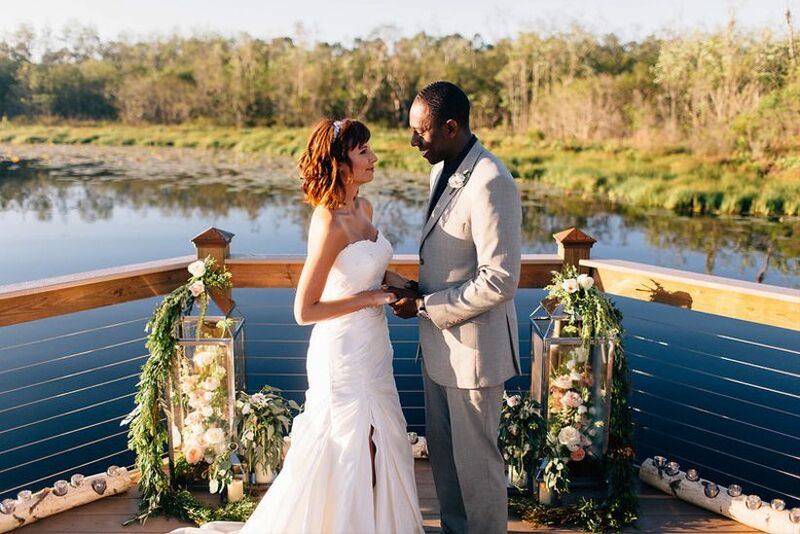 With a plethora of natural lakes and lagoons, gorgeous gardens and nearby access to the shores of the Atlantic Ocean, couples looking to wed in Orlando have tons of options for where to host a stunning outdoor wedding ceremony. 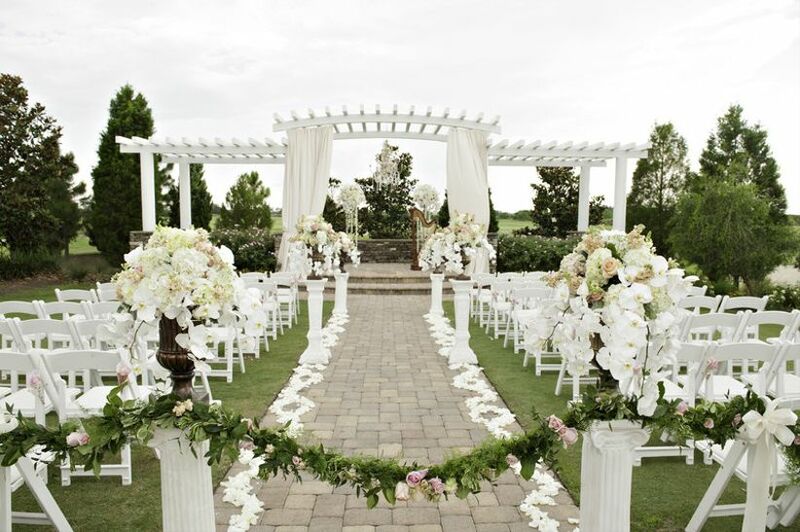 Check out the best outdoor wedding venues Orlando, and surrounding areas, offer! True to its name, The Royal Crest Room is a regal wedding venue for Florida couples in St. Cloud, just outside of Orlando. 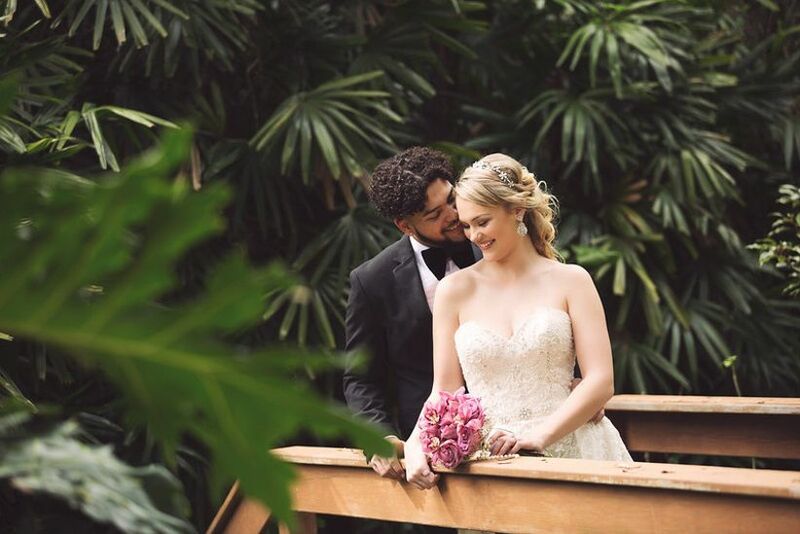 For ceremonies, couples love their stunning garden ceremony site, complete with a pergola and a rose garden terrace for the perfect romantic setting. If you prefer to head indoors for the cocktail hour or reception, there’s an open-air cathedral that still feels like you’re in one of the most amazing outdoor wedding venues Orlando offers, plus a sizable, 4,000-square-foot ballroom with a high, contoured ceiling. In total, accommodate up to 220 wedding guests at this stately venue, which is adorned with natural stonework, white pillars and plenty of overhead arches. Head to Melbourne, Florida, just off the coast of the Atlantic Ocean, to enjoy The Grand Manor, a unique outdoor wedding venue. This luxurious, all-inclusive resort is a great fit for both a destination wedding and an in-state wedding for Florida couples. As flexible as it is charming, The Grand Manor offers multiple event venues so that you can fully customize your day. 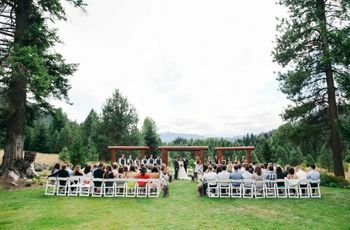 Outdoors, there’s the secret garden, which is perfect for wedding ceremonies and seats up to 200 guests. 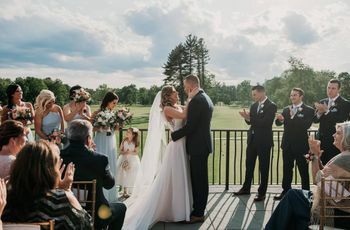 Once you’ve captured your beautiful outdoor wedding on The Grand Manor’s lush grounds, head indoors to the 2,500-square-foot ballroom that seats up to 300 or go more intimate with the small ballroom, which accommodates up to 80 guests. Bonus: the in-house chefs at this venue are incredibly accommodating with the ability to prepare more than 200 different dishes. Nature-loving couples are sure to fall head-over-heels in love with the gentle, natural beauty of The Grove. Surrounded by conservation grounds and adjacent to Lake Austin, this outdoor wedding venue is a veritable oasis amid the bustling Central Florida landscape. Offering 6,000-square-feet of flexible space that’s perfect for ceremonies and wedding receptions, couples looking for both indoor and outdoor wedding venues will find what they need at The Grove. Outdoors, there’s the Garden Terrace, a white brick courtyard and garden overlooking a lagoon and flanked by palm trees along with the Lake Austin Pier, a waterfront perch with views of the 18-acre lake. Couples searching for beach venues will want to check out Hammock Cove, a perfect white sand beach while those who wish to head indoors for cocktails and dancing have two ballrooms — The Tangerine Room and The Orange Blossom Ballroom — to choose from. This venue accommodates up to 120 wedding guests. One of the most romantic outdoor wedding venues in Orlando, The Club at Bella Collina instantly transports couples to the Tuscan countryside without leaving Central Florida. 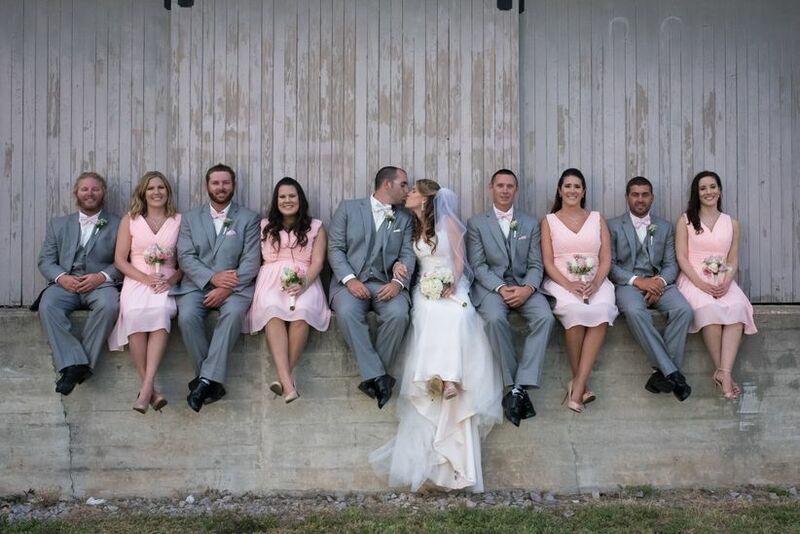 Nearly 2,000 acres of rolling hills provide plenty of space to roam while mature oak trees bring the shade and the glistening lakes of Montverde offer a cooling breeze to outdoor ceremonies and receptions at The Club. 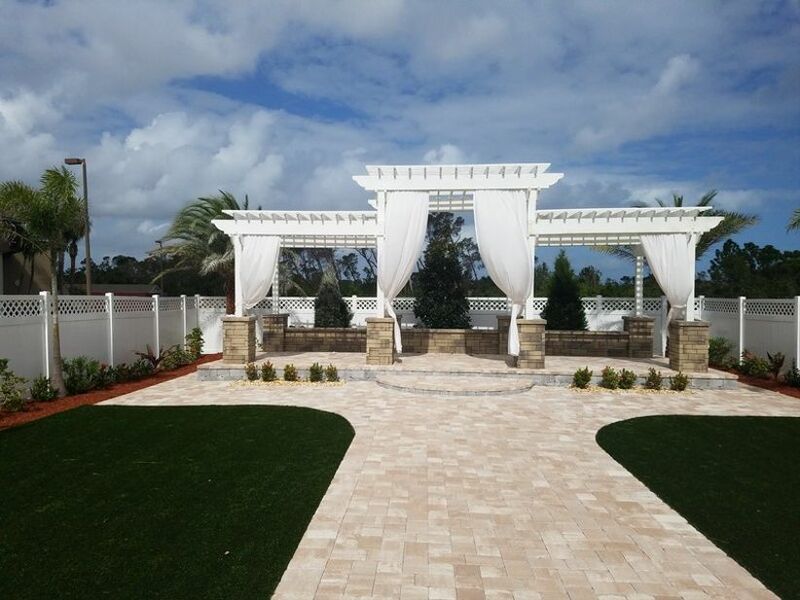 Couples looking for the perfect outdoor wedding location will love The Grand Lawn, a spacious spot of landscaped grounds overlooking Lake Siena and Lake Apopka and decked out in Tuscan architecture. 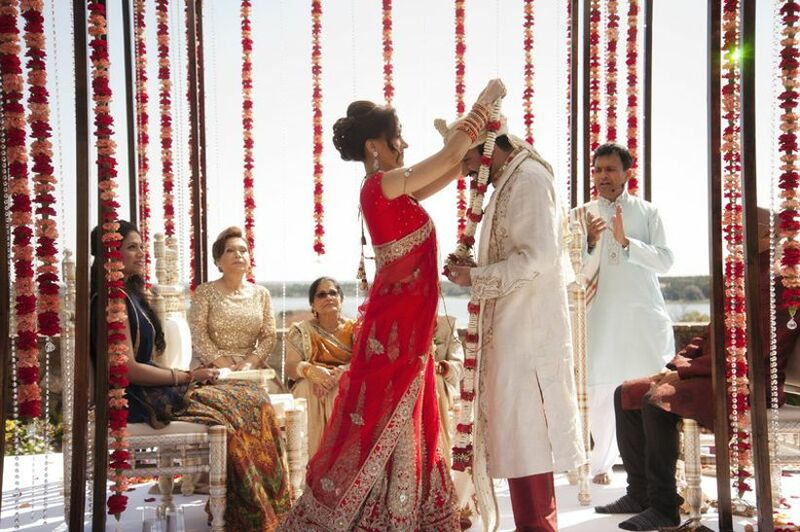 The Club at Bella Collina is also uniquely equipped and adept at managing the needs of various cultural and religious wedding needs, including hosting mares and maintaining open fires for Indian weddings. Indoors, the Atrium, Formal Ballroom and Bell Tower all overlook the unique Italian-inspired grounds and lakes. This venue can accommodate up to 250 wedding guests. 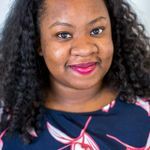 If you’ve always felt a certain kinship with the French countryside of yesteryear, you’ll definitely want to check out Maison & Jardin in Altamonte Springs, Florida. Named “House & Garden” in French, this vintage-inspired venue was recently renovated to offer modern conveniences while retaining the provincial French feel of its lush gardens and ornately decorated interiors. 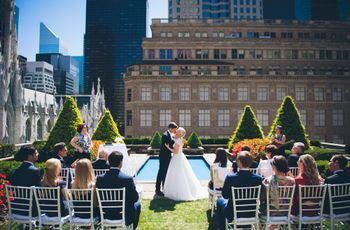 Outdoor ceremonies are held on the lush, green grounds and accented with a white antique fountain and full bushes and trees. Head indoors for gilded crown molding, intricate ceiling tiles, floor-to-ceiling windows, glittering chandelier and a neutral color palette that all drive home the upper crust ambiance of this French-inspired wedding venue. Choose between four unique event spaces and host up to 350 wedding guests at Maison & Jardin. This former train depot in Winter Park is one of the most popular outdoor wedding venues in Orlando. While it can’t be rented on Saturdays because it hosts a weekly market, Friday and Sunday weddings are hosted at Winter Park Farmers’ Market’s 2,800-square foot facility. This market features stylish exposed brick walls and wood sliding doors that are remnants from its former life as a depot, while the outdoor fenced parking lot doubles as a place to host a tented, seated reception. While the main market is an indoor, rustic space, couples often host on the spacious outdoor patio which includes a screened porch, a lounge with a fireplace, a dining area and its own restrooms. The seating capacity is 140 guests and the indoor market is air conditioned.